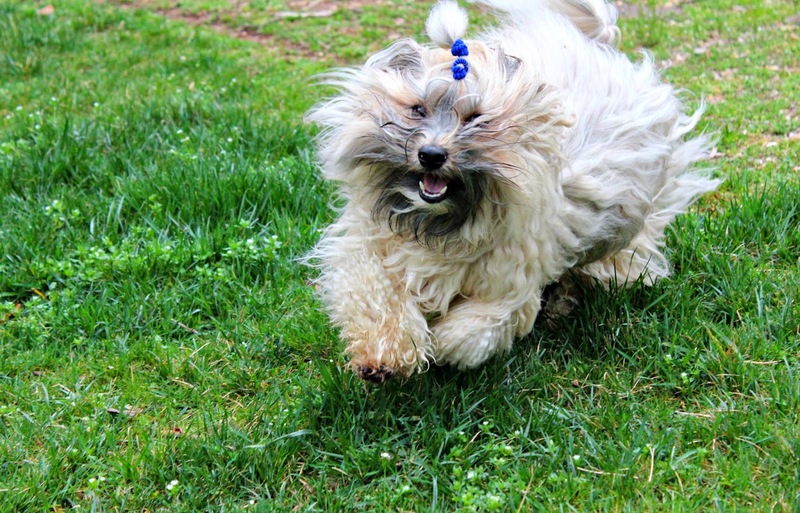 To Dog With Love: FitDog Puppy Playtime! This week we're entertaining one of Rocco's puppy pals, and I'm remembering all the joys of puppyhood ... including potty training, teething and LOTS of puppy energy! 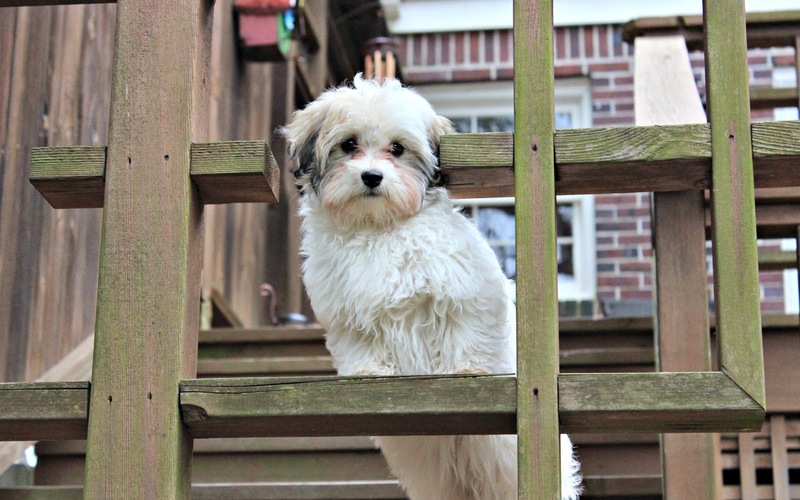 Rocco is having a blast with his pal Sophie, a 15-week old Havanese. They are wearing each other OUT! She's staying with us through the weekend, and she's a good little girl. So much fun to have a puppy in the house! Just a few more photos... ! It started out as box games until Rocco decided the box was his bed! It wasn't long before Sophie was dreaming of more play! We are always worn out when a friend stays with us. Lena is here for almost two weeks, so things start to mellow down because we are all getting worn out. It's definitely a whole new level of play! Sophie and Rocco are sleeping WELL! What a cutie. Playing is probably one of the more fun exercises isn't it? Yes! Sophie and Rocco are get tons of exercise and having a blast! oh my gosh what a cutie and so much running and playing to be had. They are having so much fun together! We can't wait to see you too! Rocco has been playing box games since he was a wee pup, so he LOVES getting in the box! Sophie is such a pretty baby! It looks like Rocco really enjoyed having a puppy playmate in the house, too! They seem to love each other! I'm pleased that Rocco is being so good with the puppy! Thank you! They are have super fun! Oh Sophie is too precious! She is a real cutie! Smart too! Rocco is so sweet to sleep in a box and let the puppy have his bed. Rocco loves boxes! We play box games a lot! They have both been sleeping so well all week! How adorable! Isn't it great that they're wearing each other out? Nothing like that puppy energy to wear everyone out! They're both having so much fun, AND sleeping so well too! 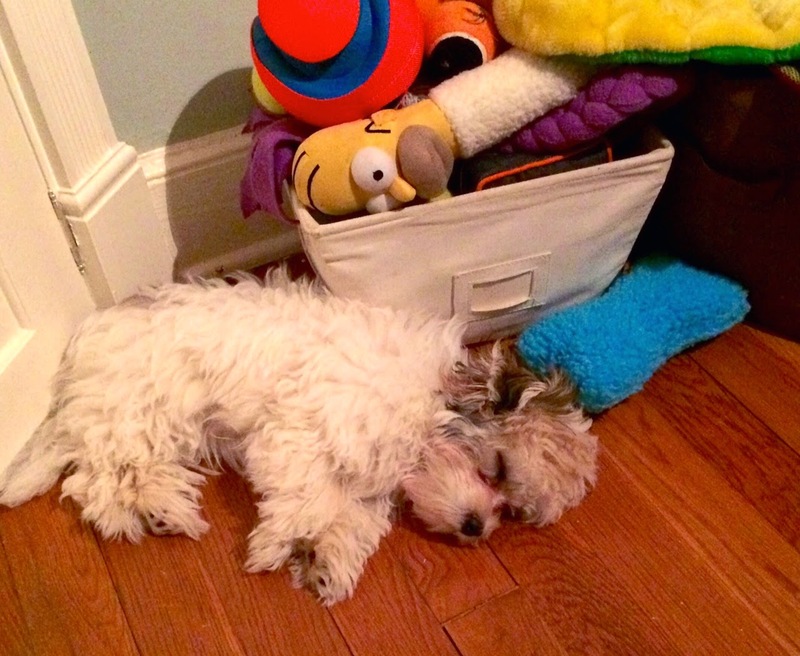 Aww, Sophie must have been totally pooped after a day of playtime with Rocco! !